Leading IT organizations view themselves as a service providers, striving to meet the needs of their business partners across multiple areas including applications, infrastructure, communications, projects, and the like. However, in many cases the finance processes used to capture, allocate, and analyze IT costs have not kept pace with the maturation of the IT operating model. This can make it difficult, if not impossible, for the IT function to provide transparent cost reporting to the business and have meaningful planning conversations based on desired service levels and other cost drivers. The PwC IT Financial Management (ITFM) & Cost Transparency app helps embed leading practices into your ITFM processes and improve process efficiency, cost transparency, and IT financial planning. The app helps automate the core processes needed to build-up unit costs for discrete IT services tailored your company’s specific IT service catalog. The app also supports allocation or chargeback of IT costs to the appropriate business target based on the methodology you define. 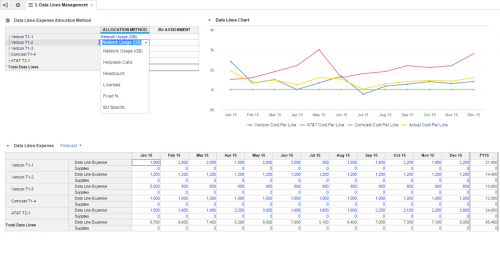 The app also provides powerful tools to plan and analyze IT costs across multiple scenarios. Leverage the PwC IT Financial Management (ITFM) & Cost Transparency app to help build a better working relationship with your business partners, have more meaningful IT cost conversations, and clearly articulate the value you deliver to the business. 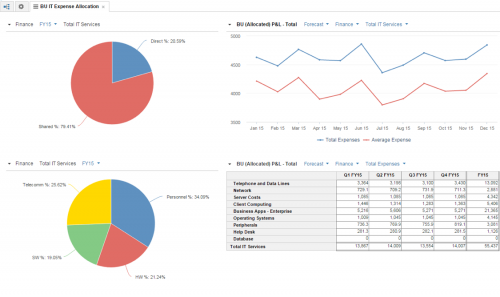 Analyze monthly and quarterly expenses by IT services and departments. Easily identify the major costs and get an overview of the growth over a year. 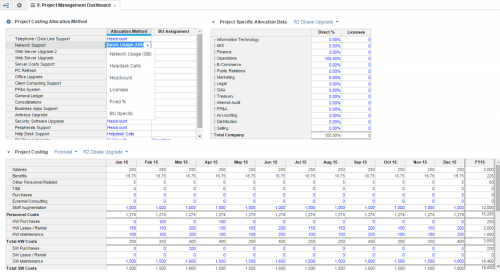 Simulate different project cost allocations, using "what-if" modeling, to set the desired allocation method. Define allocation method and assign BU / departments for IT related costs. 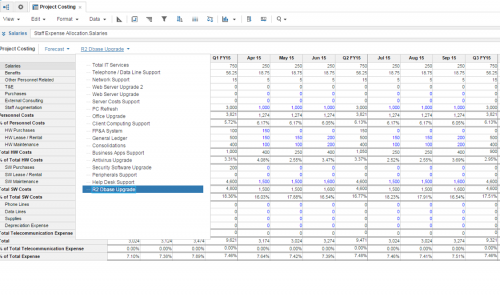 Perform analysis for each IT related cost. Dynamically model IT related expenses with visualization cues for analysis. Generate IT expense reporting by IT Service; Detail project related costs vs service and project that includes detailed expense items such as: HW, Data Lines, SW, etc. Provides IT cost reporting – Efficiently generates standard IT cost reports to provide sight line to IT resource unit consumption, unit costs, etc. Imagine the power of 180,000 people with a common purpose—building relationships that create value for you and your business. This is PwC. Every day, our people work with you to build the value you are looking for. Our specialist financial and performance management teams optimize the use of Anaplan to align planning, consolidation, reporting, and analytics processes, systems, and information to provide business insights that drive better decisions and actions.